Samsung recently released the Galaxy A80 handset with some high-end next-generation features. The device doesn’t have a notch or camera hole for the selfies. So, the bigger and wider clean look of the Super AMOLED display seems outstanding. The display features as Full HD+ resolution and comes with some of the stock wallpapers out-of-the-box. 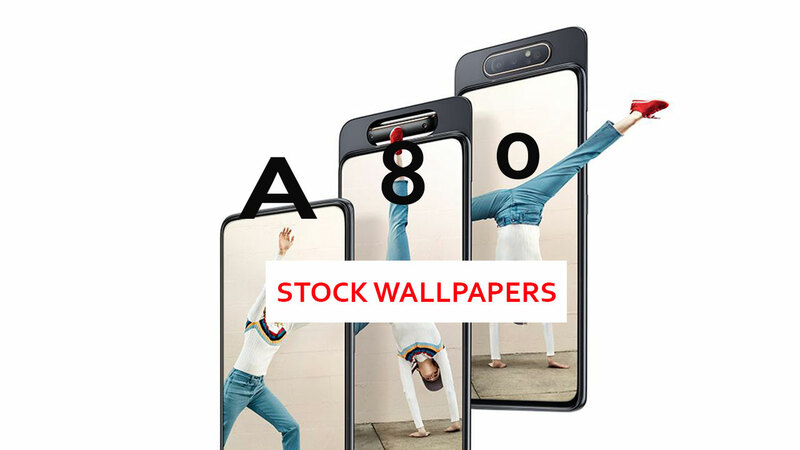 Here in this article, we will share with you the link to download Samsung Galaxy A80 Wallpapers. The device has a rotating camera module which contains three camera sensors that can take both rear and selfie images by rotating. This type of rotating single module camera was previously found in Oppo’s N11 smartphone back in 2013-14. Now, the same concept has implemented by Samsung which is automatically mechanized to rotate freely and quite faster just like pop-up cameras. Before jump into the wallpaper downloads, we have mentioned the Galaxy A80 specifications in brief. If you’re interested in this device, check out the details first. The Samsung Galaxy A80 sports a 6.7 inches Super AMOLED display of 1080 x 2400 pixels resolution. It’s running on Android 9.0 Pie based on One UI out-of-the-box. The device is powered by Snapdragon 730G SoC coupled with an 8GB of RAM and 128GB of onboard memory. The main key feature of this smartphone is that it has a triple camera setup of 48MP (f/2.0, PDAF) + 8MP (f/2.2, 12mm, ultrawide), and a 3D camera. The camera module rotates every time you open selfie mode. All the 9 preloaded wallpapers of Galaxy A80 are in Full HD+ resolution of 1080 x 2400 pixels. You can download the compressed zip file from the link given below and extract it on your handset. Any of the AMOLED display devices or 18:9 and above screen devices will fit perfectly with these wallpapers. Just extract it and set wallpaper from the gallery app or wallpapers section directly.